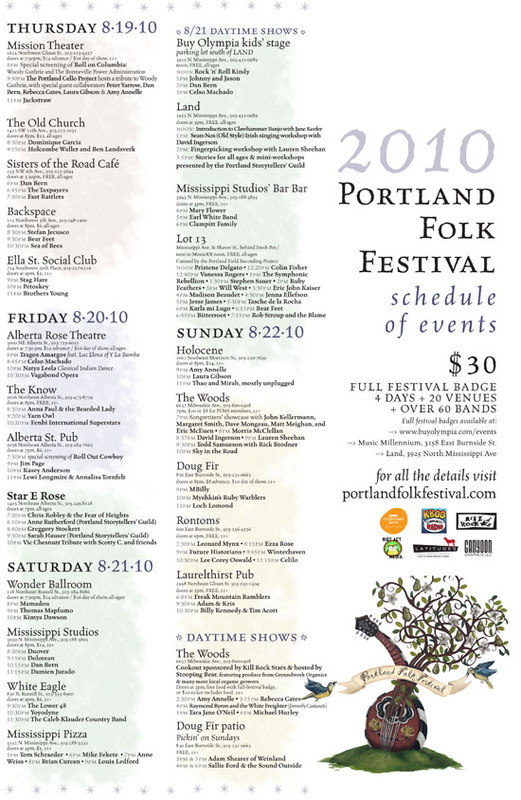 News: Inaugural Portland Folk Festival 2010 – Starts Aug. 19! The inaugural Portland Folk Festival kicks off this Thursday! As of August 16th, 2010, full-festival badges are $40 for four days, 20 venues and over 60 bands in beautiful Portland, Oregon. Do Pacific Northwesterners know how to put on a show or what! With a lineup including Kimya Dawson, Peter Yarrow and a Woody Guthrie Tribute Concert, check it out brothers and sisters. Peace. See a LEGIBLE lineup HERE.